As a result of its survey of AT&T iPhone owners, Credit Suisse raised its price target for the telecom operator's stock from $27 to $35, BusinessInsider reports. 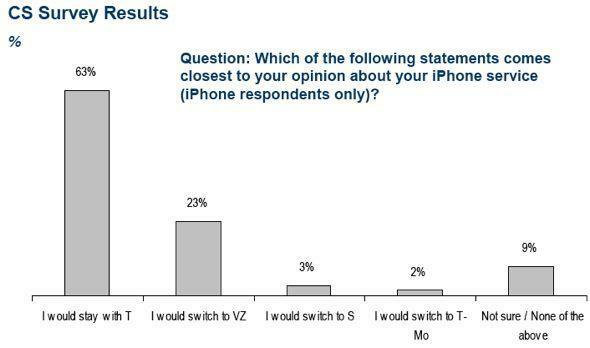 According to the report, 23% would switch to Verizon if "given the chance;" 3 percent would switch to Sprint and just 2 percent would switch to T-Mobile. 63 percent would stay with AT&T. By combining data from the survey with current subscription rates, Credit Suisse calculated that 1.4 million of AT&T's iPhone subscribers are at risk of switching to Verizon. According to Credit Suisse, the estimate, which counts for only a small percentage of AT&T's subscriber base, would have less of an impact on AT&T's bottom line than previously expected. The study also revealed that iPhone owners are less satisfied than other customers with AT&T. 51 percent of AT&T's total customers are satisfied and have no plans to change carriers, compared to 41 percent of AT&T iPhone owners. 18 percent of iPhone owners plan to leave AT&T when their contract expires, but only 9 percent of AT&T's total subscriber base plan to leave after their contract. 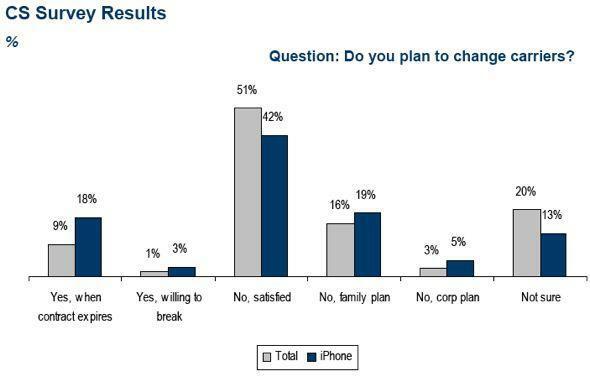 3 percent of iPhone owners would break their contracts, compared to just 1 percent of the total. Credit Suisse's figures assume a launch date of February 15, 2011 for a Verizon iPhone. At the beginning of the year, Credit Suisse placed the likelihood of AT&T keeping the iPhone's exclusivity in 2010 at 75 percent. Assuming a February 2011 launch, Credit Suisse believes Verizon could meet "pent up demand" within the first year of the iPhone's availability on Verizon. Recent rumors point to a January 2011 launch for a CDMA iPhone on Verizon. In August, Shaw Wu with Kaufman Bros. said Verizon and Apple are in talks over the iPhone, but warned that a partnership could come as late as 2012.